1. The DRM M4V Converter is capable of doing the DRM removal for Windows at a 30x faster speed that make it a much-liked tool for the conversions among many. 2. The conversion doesn’t result in any loss of any content from the videos while making them capable of being played on the non-apple devices. 3. 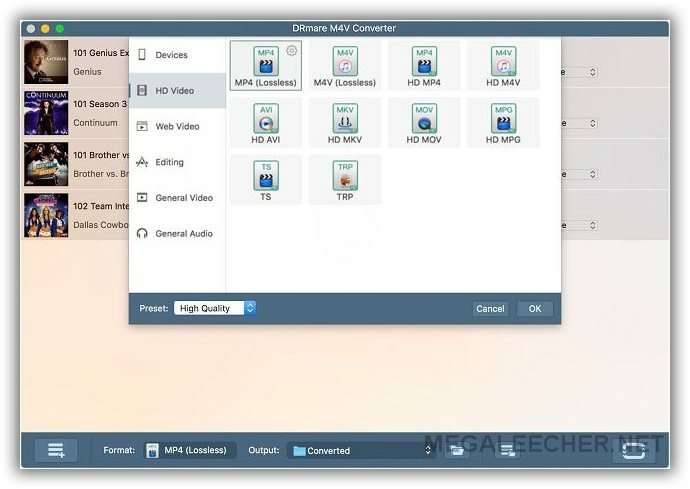 It is the best-known and fastest DRM M4V to MP4 converter you will ever come across. 4. It keeps the AAC stereo tracks, AC3 5.1 Doby surround sound, CC, AD, subtitles, etc. 5. It doesn’t only eliminate the DRM from your iTunes library but also converts the video content into different output media codec as per your requirement. 6. If you have recently switched from Apple to any other device, you will still be able to access your favorite videos. 7. If all the above is not enough, this DRM removal software provides all-time customer support with a 60-day money back guarantee if you are not satisfied with the converter. First of all; you will have to add the iTunes M4V videos to the converter. For this, click on the “Add” button that is placed at the bottom left of the program. This will take you to choose the iTunes movies and TV shows you want to remove DRM from. There are two options, purchased and rented, that you can choose from. After choosing the files, you will have to click “OK” to load the file to the DRM M4V Converter. If you prefer, you can also drag and drop the files directly to the program. The best part about using this DRM removal program is that you have the choice of customizing different aspects of the video you imported. You can customize its format, audio tracks, output folder, and subtitles, and other things as per your choice. For Windows, it offers MP4 and M4V format conversions. For more customization, you can click on the little gear icon on the format to customize the video parameters like the video codec, size, bit rate, etc. in accordance with your requirements. And now, you will have to click on the “Convert” button and apply the settings. This will start converting the DRM-protected iTunes M4V video content to the DRM-free video content. It has been found that it works at conversion speed 30x faster than any other converter software. To clear, the conversion speed will depend on the amount of iTunes videos content you are going to convert. The conversion will be done in the minimum possible time. After it has completed, you can check the history in order to locate the converted DRM-free iTunes content. And then, the content is ready to be played on any non-Apple device without any obstacles. You can transfer the content to any of the Windows devices of your choice and that too without any restrictions. 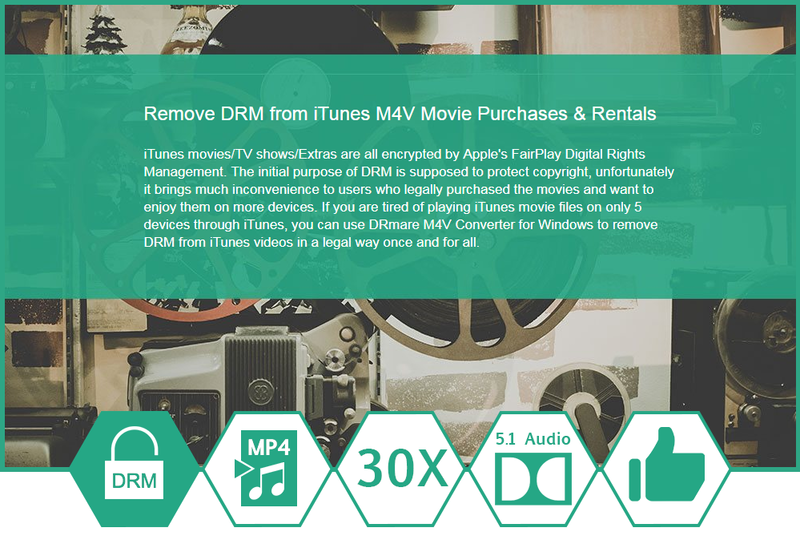 The DRM M4V Converter for Windows is the best DRM removal tool that has the entire DRM removal feature for iTunes video content. Moreover, it is a legal and convenient solution for you make your iTunes videos free from DRM and ready to be played on any device. Some of its most attractive features include intuitive design, faster-converting speed, and better quality of output videos in comparison to other software. However, like all the positive points, it has some drawbacks too. It doesn’t support the audio file formats for the conversion. And its Windows version is not fully equipped. It doesn’t support numerous output options like its Mac version. Still, it is the most reliable and advanced video DRM removal program for the iTunes videos conversion. It is available in two options, the purchased one and the rented one. Now, it depends on your choice and budget which one you want to buy! !